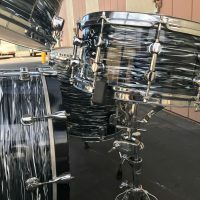 This Custom one of a kind, Mapex Saturn Pro drum set was owned and used by Gregg Bissonette most notably on Electric Light Orchestra’s 2001 Zoom reunion tour. 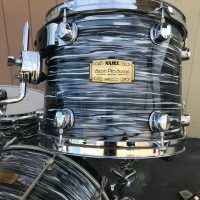 Gregg has been one of the most in demand drummers in the business for decades and was a perfect fit for singer, producer and ELO founder Jeff Lynne’s sophisticated arrangements. The set can be seen prominently in full length concert video that was produced for the tour. 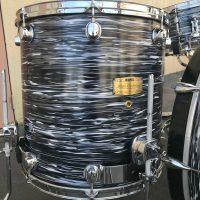 Bissonette had the set custom finished in Black Oyster wrap in homage to his all-time favorite drummer, Ringo Starr. Ironically, a few years after working with ELO he would become the full time drummer in Ringo Starr’s All Starr Band. The set is in excellent condition. 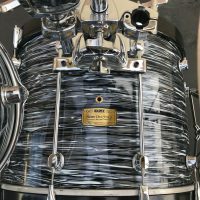 There are some slight cracks in the wrap finish that are visible in the photos, otherwise there are no notable flaws. The photos depict the condition of the set accurately. Certificate of Authenticity and ELO Zoom Tour DVD signed by Gregg Bissonette. Gregg will also sign the heads and drums in any manner the buyer would like. 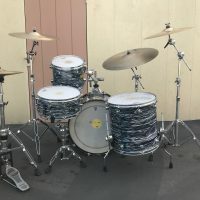 The drums will ship from Los Angeles, CA. 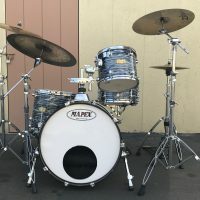 Plan on about $600 for US shipping. The set includes the following. 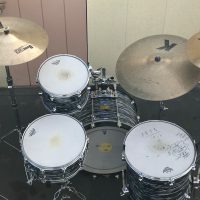 22” K Custom Dry Complex II, 18” A Custom Projection Crash, 18” K Dark Crash Thin, 14” A Mastersound Hi Hat. See and hear the set in the ELO 2001 video at the bottom of the page. PRICE: $8,995.00. Serious offers considered.